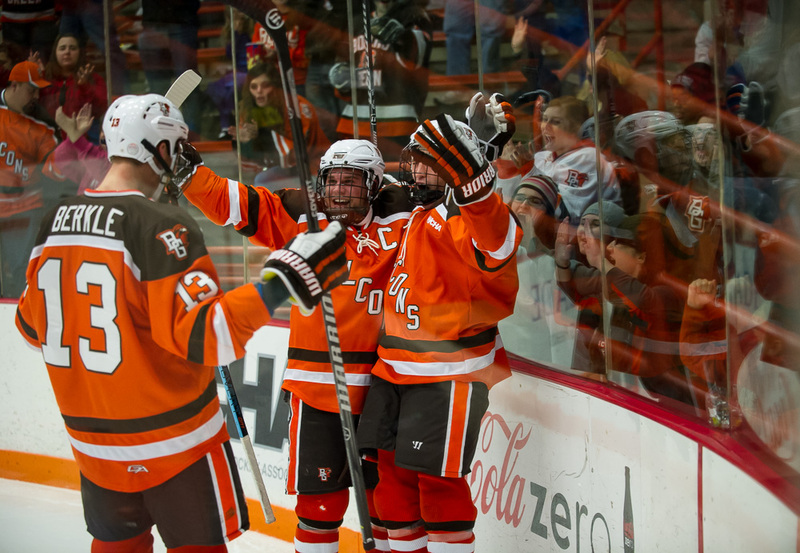 Bowling Green’s hockey team had plenty to be happy with Saturday afternoon. Most of all, the Falcons played well overall en route to a 7-2 rout of Simon Fraser University in an exhibition come to to contest at the Arena. They finished with the game with a 61-13 edge in shots on goal, although they scored the final five goals to pull away from a 2-2 tie. The Falcons held leads of 1-0 and 2-1 before going ahead for good at 3-2 when Mitchell McLain scored with 4:57 remaining in the second period. Third-period goals from Brett D’Andrea at 3:41, Jakob Reichert at 6:40, Tyler Spezia at 12:20 and Pierre-Luc Mercier at 17:16 broke the game open. Spezia’s goal was short-handed, and Mercier scored on the power play. Ben Murphy and Mike Sullivan had BG’s other goals. BG goalies Tommy Burke, Tomas Sholl and Chris Nell combined for 11 saves, facing only a handful of difficult scoring chances. Because the contest was an exhibition, the result and individual statistics don’t count on BG’s record. The Falcons, as expected, showed some rustiness at times. Saturday was the first official day for practice under NCAA rules. NCAA rules do allow teams to be on the ice for two hours a week starting Sept. 15. “For us, when you have 36 games guaranteed, the exhibition game matters, just in terms of playing a game, being able to compete against somebody else, and being able to hit somebody else,” Bergeron said. SFU’s Jordan Liem kept the score respectable with 54 saves, 23 coming in the second period. The Falcons open the regular-season next weekend against 11th-ranked and former Central Collegiate Hockey Association rival Miami. 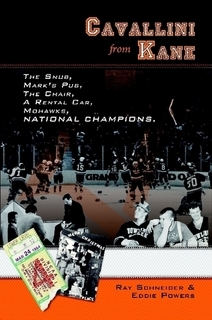 The teams play Friday at 7:07 p.m. in the Ice Arena and Sunday at 5:05 p.m. in Oxford. PUCK CONTROL: BG dominated most of the game by controlling the puck in its offensive zone. The Falcons attempted 101 total shots, compared to just 18 for SFU. The Falcon defensemen also helped with the offense, a point of emphasis for BG this season. Sullivan had a goal and two assists, while Mingo and Sean Walker each had one assist. The defense had 17 shots on goal, including seven by Sullivan and six by freshman Mark Friedman. Senior Connor Kucera and freshman Nolan Valleau also skated on defense. DEFENSE: BG defended well, allowing just the two goals and 18 shots on goal. However, SFU’s first goal came off a defensive-zone breakdown by BG. “You can’t have breakdowns like that or they do end up in the back of your net,” Bergeron said. Friedman was one of two freshmen who skated on defense, joining Nolan Valleau. GOALIES: Bergeron was pleased with BG’s goaltending, although it was rarely tested. Burke stopped a breakaway and made another point-blank stop in the first period when he had five saves total. Sholl faced just two shots in the second period. Nell made five saves in the third period, including a couple from in close. Burke and Sholl allowed the goals. Bergeron said all three are expected to start once during BG’s first two regular-season series. After Miami, BG travels to Alabama-Huntsville Oct. 17-18 for a Western Collegiate Hockey Association series. Bergeron said Burke started against SFU because he was a junior, Sholl was next in the second period because he was a sophomore and Nell played the third period because he was a freshman. NEWCOMERS: The freshmen line of Spezia on left wing, McLain at center and Reichert on right wing played well. The three combined for three goals and five assists. Freshmen forwards Brett D’Andrea and Ben Greiner had solid debuts, as did Brandon Hawkins, who skated with sophomores Mercier and Matt Pohlkamp. BG is looking to fill the void of standout forwards Ryan Carpenter, who left after last season to sign with the NHL’s San Jose Sharks; and Bryce Williamson, who was a senior last season. MCLAIN & CO: The line of McLain, Spezia and Reichert combined for 11 shots and an on-ice rating of plus 11. All three are expected to have a significant impact on the offense this season. “They were pretty good,” Bergeron said. “The McLain line, they were as advertised. The three have been skating on the same line since training camp started. “We were all excited to play a game,” Spezia said. “Coach has a system, and we played the system and out-worked the opponent. We’re just getting better every day. FRESHMEN: In addition to seeing a regular shift, BG’s freshmen forwards and defensemen are receiving ice time on the special teams. “It’s been a culture change, especially adding school to the mix,” Spezia said of the freshmen. “But we’re a close-knit group. We’re learning from the older guys, and they’re showing us the way. This season’s team is the first consisting of all players recruited by Bergeron, and assistant coaches Barry Schutte and Ty Eigner. The staff is in its fifth season. PP/PK: The Falcon power play was 1-of-5, but had 13 shots. BG used two different power-play units and both generated chances. SFU was 1-of-4 with the extra man and had just three shots. PENALTIES: BG had four penalties for 19 minutes, including major and game-misconduct penalties for checking from behind to Tate at 2:29 of the second period. SF had five penalties, all minors. LINEUP: Not dressing for the Falcons were senior defenseman Rusty Hafner, senior forward Ted Pletsch, junior defenseman Jose Delgadillo and freshman defenseman Austin Carroll.